Well, thank heaven's there are still a few magazines left! Much obliged, England, for keeping us in style with LivingEtc. Loads of galleries with oodles of inspiration. I am always mulling over what to do with these "orange peel" walls of mine (aside from painting over the beige!) and I spent entirely too much time culling the LivingEtc archives. Eh, Rome wasn't built in a day and I'm guessing London wasn't either. So no pressure. Um, right? i loved my "orange peel" walls when I painted them in high gloss! but i live in a 1920's stone english cottage...so that look may not work for everyone! why can they support so many damn good shelter magazines over the pond? what are we not doing? You posted some of my favorites & a few new inspirations. 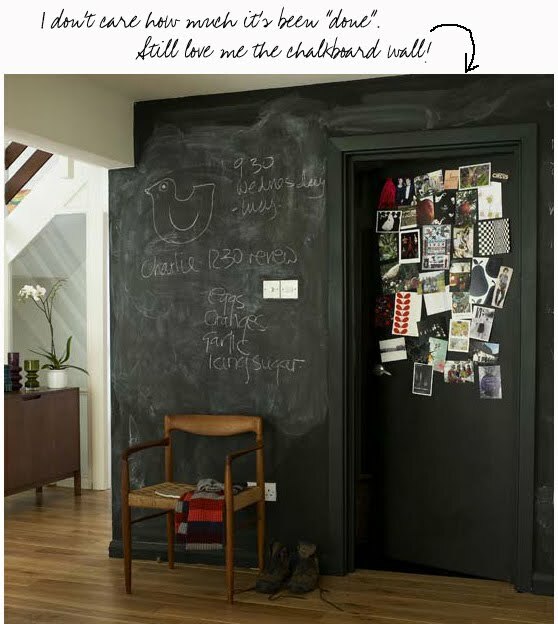 Never tire of a chalkboard wall, especially done in the fashion showed. It's when they get too cutesy. 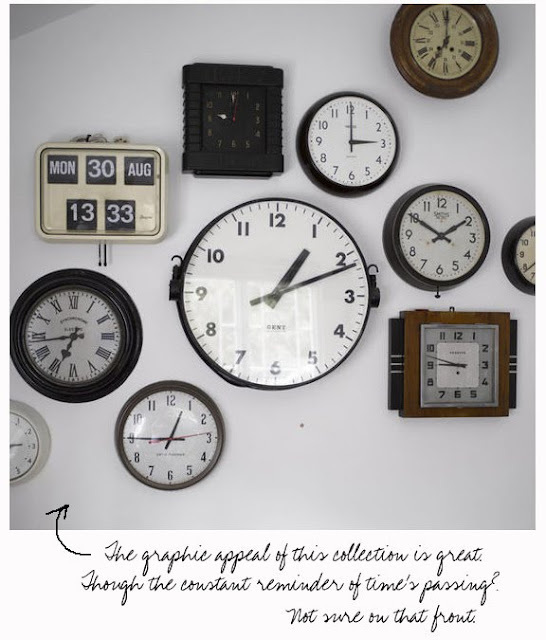 So fond of a wall of clocks, but I agree, not sure anymore if I fancy starring at time slipping away? 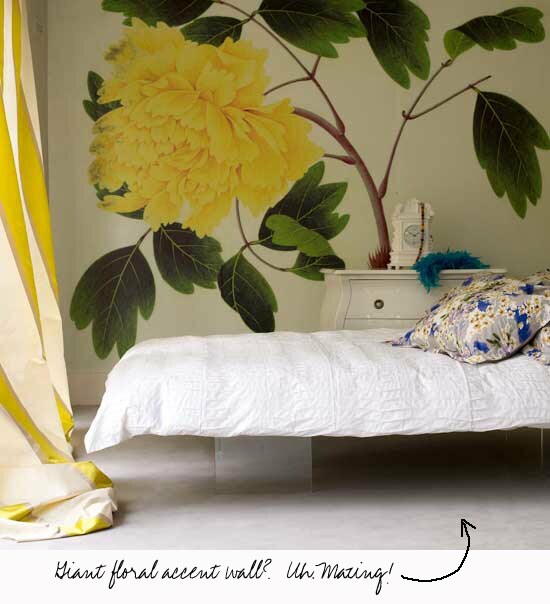 The flower wall mural is SO purdy!! Great post! I just adore this mag! It's one of my monthly treats! I am totally crushing on your blog! I've always enjoyed your comments, but I just adore your posts! Gorgeous pictures with witty commentary (and from a fellow Seattle-ite no less!). I lurve Living Etc but I have sort of moved on from chalkboard walls. Ok, that's a lie. I never really liked them. The dust! The nail scraping (shudder). Although on an interesting note, I DO like to have a clock in every room. Go figure. I love ALL of this. 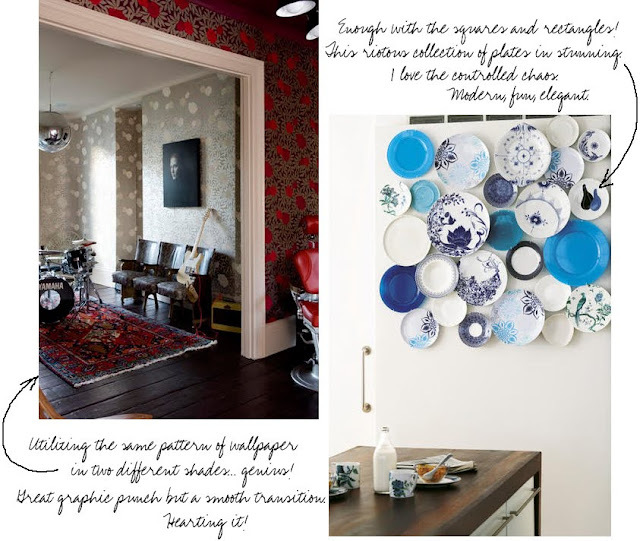 Oh, I wish I had the resources and the energy to redecorate our house with real boldness like these pictures. I just don't know where to begin! No pressure at all! Like you I love Living etc - my favourite magazine without a doubt! That flower wall! I can't get over it! but I'm sure I'd go bonkers feeling the unconcious pull to stop and look at each one every time I passed. Going on a hunt for that mag.